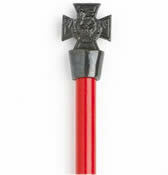 WRCMVC/PT - Victoria Cross Pencil Topper - Pewter. A bronze plated pewter Victoria cross mounted on top of a blue or red pencil. Introduced as the premier award for gallantry, available to all ranks, to cover all actions since the outbreak of the Crimean War in 1854. A cross pattee. Obverse - a lion statant gardant on the royal crown, with the words FOR VALOUR on a semi circular scroll. Reverse - a circular panel on which the date of the act for which the decoration was awarded would be engraved. This miniature Victoria Cross is made from bronze plated lead-free pewter and is mounted on a red or blue pencil. Fun collector's item for historical enthusiast. Great for historical education � awesome way to get children interested in history! Perfect for Roman history, Renaissance History, Medieval History. Dark Ages History. Medieval Military History, Renaissance Military History, Roman Military History, Dark Ages Military History, Gladiator History, Knight History, Cavalier Military History.